Research associate Jade Myers 3D prints prosthetic devices that are distributed in impoverished countries through the nonprofit company Limb Forge. Millions of people in impoverished countries need prosthetics. Helping to meet that need is Jade Myers, an RIT alumna and lab manager at the RIT Access Technology Prototyping Lab. Myers has also done work as a research associate with LimbForge, an international nonprofit designing culturally appropriate and affordable 3D-printed prosthetic devices. Myers told the story of Danie, a young girl she met during a trip to Haiti, where the health care system is stretched amid poverty and the lingering effects of a 2010 earthquake and a recent hurricane. The situation can be dire for individuals who have lost limbs—and as a result, their livelihoods. Danie was 13 when the earthquake hit, destroying her home and killing her mother. Danie’s arm was pinned under a concrete wall. It was hours before neighbors attempted a rescue, and she ended up amputating her own limb to free herself. It would be days before she received care at a make-shift hospital. Myers fit Danie with a forearm prosthetic. She has kept in touch with the young woman over the years, watching her successfully rebuild her life. Limb Forge, made up of developer-researchers such as Myers, evolved from the earlier e-Nable initiative. Limb Forge creates 3D-printed prosthetics, but with newer materials and more sophisticated, life-like designs, in a process that’s faster and more cost-effective than traditional manufacturing. Several engineering and industrial design students created an elbow joint with improved flexibility. 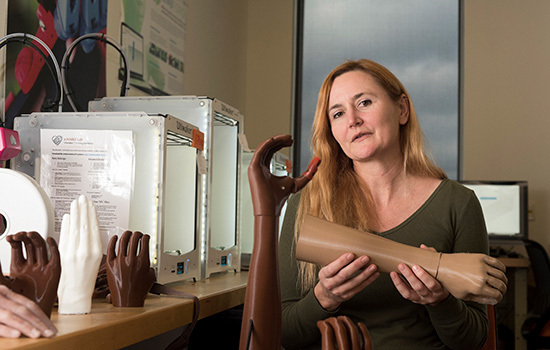 Another group tests prosthetics resistance to heat, UV light and moisture. The company makes available computer programs for clinicians to input measurements to configure and produce limbs of proper dimensions with varying skin tones. As part of the company’s global outreach, training to use the program and printers is included. Myers helped train clinicians at Haiti’s Healing Hands Clinic to use the six 3D-printers donated by Limb Forge.